This brush has a bamboo handle and will hold much more water while remaining soft & flexible. The short square handle provides a steady grip and increases control. The Haik Brush is used to apply kiln wash to kiln shelves and ceramic molds with a minimum of brush strokes. Not recommended for stainless steel molds. Taurus 3 is everything you could want in a ring saw! 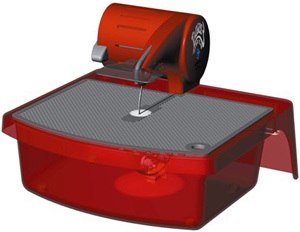 Features a 1/5 hp motor, a 5-3/4" blade and weighs 14 pounds. --Amazing portability: the saw snaps out of the reservoir to make cuts on-the-go --Quieter: half the noise of older models --Bigger work surface --Built-in spotlight and face shield that flips-up --Less maintenance and easier cleaning --Optional megablade that will cut through just about anything --Three year warranty (excluding blades) 25% larger work surface, Greater blade exposure plus a built-in bright white light that surrounds the blade while the saw is on. 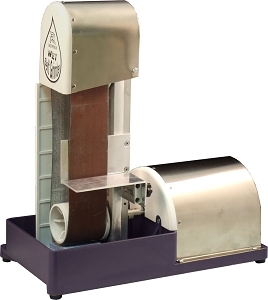 The entire working part of the saw snaps out of the water bath and contains its own water so it can be used as a portable saw. The manufacturer of the Taurus Ringsaw have put together some really informative & fun videos on their saw. Professional Grade Precision Tool Features a vacuum cup for a sturdy grip on the cutting surface. The cutting unit has an automatic oil-feed and a replaceable wheel and axle. 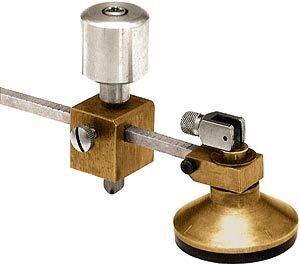 The blade swivels to align the wheel for left or right hand scores. The extra long cutting bar gives you the ability to cut small to very large circles. The cutting unit is positioned on a pivoting radius bar which is ruled for precise adjustment. Cuts circles from 2-1/2" to 48". Getting straight, smooth, finished edges has never been easier! The high power, low maintenance motor will make fast work of your grinding, beveling and polishing needs. With an incredible 3 inch wide sanding belt, available in 4 grits, finishing edges or creating custom bevels is a breeze. The built-in adjustable platform supports your project to prevent fatigue and keep a consistent angle.